If you want to hear the heartbeat of the St. Ignatius tribal community, listen for it at the Longhouse. Funerals and wakes are held there. On racks outside the building, the people often dry meat that has been donated to serve those who come for the many gatherings and meetings that knit a society together. One of the organization’s primary tasks is to record the history of the Salish and Pend d’Oreille peoples, said director Antoine Incashola. 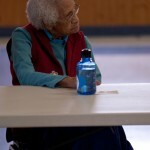 To save the stories, the committee has interviewed dozens of tribal elders and recorded their memories. Today, the tribe’s youth have access to more than 300 audiotapes containing hundreds of hours of interviews, some in the Salish language, some in English. Language specialist Shirley Trahan is responsible for transcribing the tapes from Salish to English and vice versa. The committee also participates in cultural and tribal events in the surrounding area, such as the annual fall bison roundup at the National Bison Range, where Incashola offers the opening prayer. Members of the culture committee are active beyond St. Ignatius. They speak at schools, town meetings and local events. Each year, Incashola meets a group of Corvallis High School students at places of cultural significance to the Salish and Pend d’Oreille peoples. He shares with them the knowledge passed on to him by his ancestors. 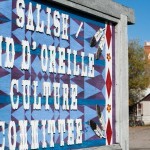 The Salish-Pend d’Orielle Culture Committee was established in 1974. Today, the culture committe is housed in a Longhouse in St. Ignatius, Mont. 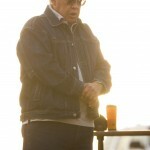 As the sun rises over the Mission Mountains, Antoine Incashola, director of the culture committee says an opening prayer at the annual bison roundup at the National Bison Range on Oct. 3, 2011. Germaine White volunteers at the bison roundup. 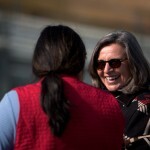 White, a former member of the committee, shared her knowledge of the roundup, the buffalo, and the Salish-Pend’ d’Orielle culture with members of surrounding communities who had come to watch the roundup. 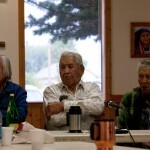 Members of the Elder’s Cultural Advisory Council (L-R) Stephen Small Salmon, Pat Pierre and Eneas Vanderburg, listen to a proposal by representatives of tribal housing and health programs at the councils meeting on Oct. 5, 2011 at the Longhouse. 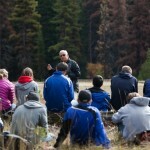 Antoine Incashola, director of the culture committee, speaks to students from Corvallis High School at Faels Flat in the West Fork of the Bitterroot Valley, Mont. on October 19, 2011. The area was an important place for gathering and preparing camas roots for the Salish and Pend d’Orielle peoples. 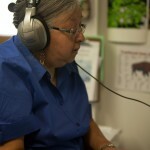 Language Specialist, Shirley Trahan, transcribes from English to Salish a passage from one of over 300 audio tapes at the committee headquarters. The audio tapes contain the oral history and tradition of the Salish-Pend d’Orielle peoples. 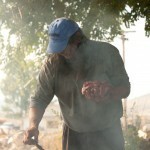 Alan “Chauncey” Beaverhead, dries elk meat donated by a member of the community outside the St. Ignatius Longhouse. The meat is dried then stored there to be served during future events. Beaverhead rotates strips of elk meat drying outside the committee headquarters. 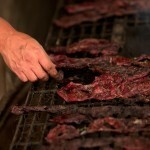 The donated meat is sliced thinly and then placed on racks above a small smoldering fire. After the meat dries, it is stored in paper bags.